Thirsty Pilgrim: Down on Struise Farm. Urbain Coutteau and Carlo Grootaert of Struise are two of the most hospitable guys in Belgium. A buddy and I were out in West Flanders last week and stopped by the Struise farm. Not to see the ostriches this time, but just to say hello, bring them a couple beers, and taste a few things. So glad we did. I annoyingly call them "beer geek darlings." I pepper them with questions about their long-term plans. Yet they show me a good time anyway. Great couple of guys. We also got to meet Devon and Beejay, their two American apprentices. Those dudes are working their butts off and loving it. With a partner back home they plan to start a new craft brewery. Watch for it, and expect them to bring a healthy dose of Belgian eccentricity to the US scene. 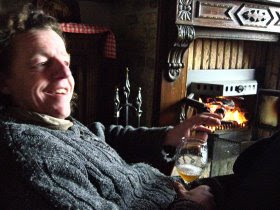 Anyway, a few beers, a roaring fire and great conversation made for a fine afternoon. Here comes the useful part: Not a lot of people realize the Struise farm, called Noordhoek, doubles as a rural holiday spot. With advance booking it can handle groups of anywhere from two to 25 people. 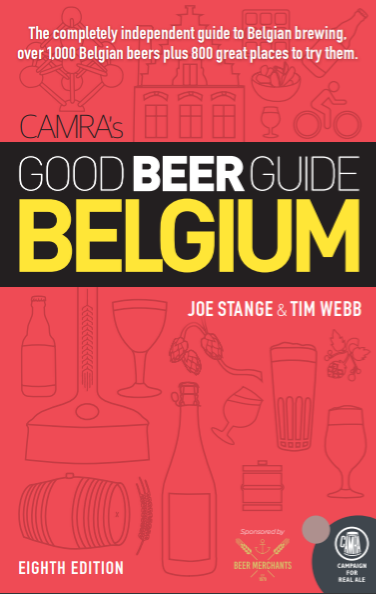 Its location in Lo provides a reasonable base for beer tourism in West Flanders, including Westvleteren, De Dolle and Watou. Plus you'll almost certainly get to try some Struise beers while you're there. For booking in English, this page is your best bet. Getting Silly: Big thanks to Randy for passing on this link: Stars & Stripes did a quick-and-dirty piece on visiting Silly and drinking its beer. Random, yes, but worth a look. I'd say call up the Westy beer phone and find out: 070210045.